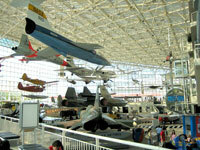 Next to Boeing Field, south of downtown Seattle, the Museum of Flight consists of a six-story glass and steel construction, which was the original Boeing factory and used to be one of the mainstays of Seattle's economy. Inside is a collection of more than 130 aircraft, some suspended from the ceiling, including some of history's most famous airplanes. There is, for example, a replica of the Wright Brothers' first glider and the original Air Force One presidential plane used by Eisenhower. The museum covers the entire history of flight right up to the space programme. The Museum's most recent acquisitions include a British Airways Concorde, the only one on America's West Coast, and NASA's Full Fuselage Trainer. Concorde arrived in true style setting a new world record time from New York to Seattle, while NASA's FFT has been retired from use and is making its new home at the museum. Changing exhibitions are hosted and changed regularly to keep things interesting. Restoration work on various aircraft is constantly ongoing at the museum, with 2 to 4 new acquisitions every year and about twelve aircraft being worked on at any one time. The museum also contains exhibitions of aircraft photography, artefacts, and archives. Opening times: Daily 10am-5pm; open until 9pm the first Thursday of every month. Closed Thanksgiving and Christmas. Admission: $23 adults, $14 children 5-17. Other concessions available. Online discounts available.